Trickle Up works with women who live in ultrapoverty, providing training and a grant to start or expand a business. 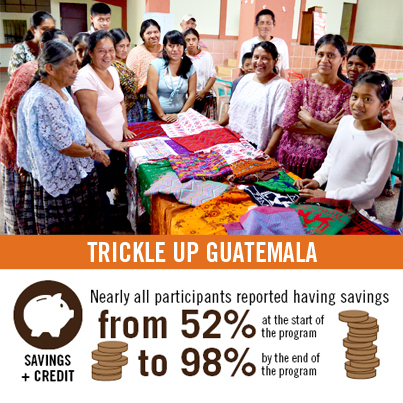 To ensure the longevity of their hard work, learning to save and access credit is essential, which is why Trickle Up helps participants form savings groups. These voluntary, community-based, self-managed groups meet regularly and enable women to save as a buffer against emergencies and unexpected expenses, while also being able to access credit to grow their businesses. Even more, women build solidarity, enabling them to learn from one another and be a support base in times of need. Read more over at the Catapult Blog.